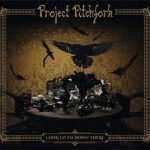 Genre/Influences: Dark-rock, goth-rock, goth-metal, epic, medieval, ballad. Background/Info: ASP is a real phenomenon. Alexander Spreng is the creative spirit and strength behind this German formation, which became a very famous and recognized formation in Germany, but unfortunately rather unknown in non-German speaking countries. This album is something really special that happened during the end of 2014. 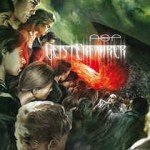 ASP did a live tour in 10 German cities playing 2 days in each town. The first date they performed a kind of semi-unplugged concert and the day after a harder and more familiar ‘rock’ style. This album features 4 CD’s and a total amount of 49 tracks, which were recorded during the ‘Per Aspera Ad Aspera’ anniversary tour in the autumn of 2014. Content: The first part entitled “Rar Und Pur” features the semi-unplugged adaptation of some of the band’s most famous cuts next to some ‘rare’ songs. It reveals another side of ASP, which is more sensible and intimate like some kind of fragility the band is showing. It reveals a gothic and somewhat cabaret-like exposure, which has been merged together with ballad passages. Some harder metal intrusions are there to remind us to the real sound of ASP. And this sound even moves into good-old new-wave elements reminding me of bands like The Chameleons and Sisters Of Mercy. 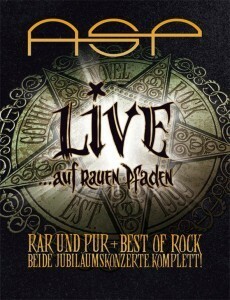 The 2 CD’s left entitled “Best Of Rock” are a kind of live ‘best of’ revealing some of the band’s most famous cuts bringing us back to a song like “Weltunter” and essential hits like “Ich Bin Ein Wahrer Satan”, “Werben” and the unavoidable “Ich Will Brennen”. ASP reveals an impressive live maturity and a sound filled with power and rage on one side, but still delicate and melancholic passages on the other. + + + : You’ll either like or dislike ASP, but there’s one thing you can’t deny when listening to this album, and that this is an impressive live band entertaining the audience. And you can hear that the audience is totally devoted to their idols! There’s a great and often funny interaction between the front man and his fans. You can feel their love and passion for ASP, which even seems to become something sacred. The recording is absolutely high-tech, but ASP clearly reveals to be professionals featuring experienced musicians and a great singer. I love both parts of this box although I prefer the “Best Of Rock” for being harder and powerful. One of my personal favorite songs is the somewhat folk-metal like “Sing Child”, but both versions of “Per Aspera Ad Aspera” are other noticeable cuts. Last, but not least I also have to say a word about the artistic box featuring an impressive booklet and a certificate with your hand numbered copy (there are 7000 copies of the album). – – – : I’m not what you could call an ASP fan, but I regret this live album hasn’t been released as a DVD. Conclusion: If you can’t understand why ASP is so popular in their homeland, just listen to a few cuts of this album and you’ll quickly agree this is a real phenomenon! Respect! Best songs: “Coming Home”, “Ich Will Brennen”, “Carpe Noctem”, “Finger Weg! Finger” + “Lykanthropie”, “Werben”, “Ich Will Brennen”, “Sing Child”, “Schwarzes Blut”.